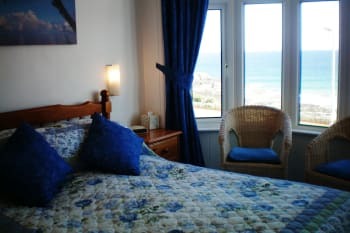 Westcliff is superbly situated directly facing the Coastal Footpath and the golden sands of Porthmeor Beach. The Harbour, shops and other beaches are only a few minutes easy walk away and the famous St Ives Tate Gallery is close by. Breakfast is offered between 8.30am - 9.00am and includes a delicious full English breakfast or vegetarian option. Wherever possible we serve Cornish free-range eggs, Cornish milk and butter, and quality bacon and sausages from our local suppliers. 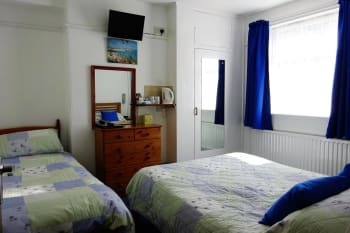 2 Double Rooms with sea view, and 1 Family Room (double & single bed), all with en-suite shower, toilet and basin. Allocated car parking space for each room (sorry, we cannot accommodate wide vehicles e.g. vans or 4x4s), free Wifi, unrestricted access. 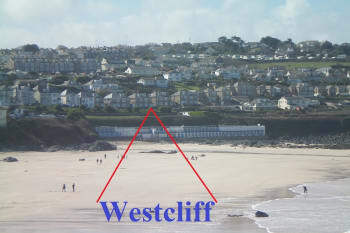 Westcliff's location offers a peaceful retreat, ideal for a beach holiday, or as a base for touring West Cornwall. Guests return year after year for the friendly relaxed atmosphere. Total rates, from Sat 27 Apr 2019, to Mon 29 Apr 2019, for 2 nights. Groups: Groups are accepted up to a maximum of 7 people. No stag and hen groups. Terry and Mike are very friendly and accommodating. I really appreciated staying with you because your house is located far from the crowded and touristy downtown. The view on the beach is wonderful. Thank you too for driving us to the Penzance train station. Thank you so much for your review - it was a pleasure to meet you and we are so glad you enjoyed your stay in lovely St. Ives. Thank you for your review. We try to keep the decor in keeping with the age and style of the property but appreciate your comments. We are very glad that you enjoyed your stay. 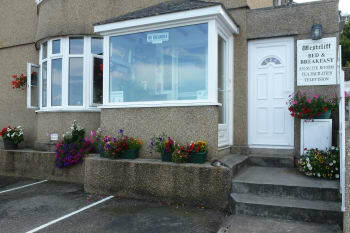 Excellent location overlooking beach and Tate gallery, with space to park. Great room, very clean. Owners friendly and helpful without being intrusive. Lots of great local restaurants but worth booking ahead. Thank you for your review. It's always good to know that our guests enjoyed their stay. Very nice place with great view over the beach from room 4. Breakfast was excellent. Well run by Terrie and Mike who are really nice people. The cafe just along the beach is great. Most places in the harbour area to eat. It pays to reserve a table to guarantee place. Thank you for your lovely comments. We are so glad you enjoyed your stay. It was lovely to meet you and we are glad you enjoyed your stay. Thank you - you two are lovely guests. Looking forward to seeing you again next year. A very homely place nothing too much trouble happy to oblige a real home from home feeling. It was lovely to meet you properly this year - looking forward to seeing you again in 2019. Already have told everyone how lovely our stay was. Room was lovely, breakfast was lovely. We didn't want to leave! Thank you so much - Mike and I are really glad you enjoyed your stay. Very friendly and homely feel,Very helpful and obliging. Thank you for your review - we are glad you enjoyed your stay. We frequently revisit as the location, quality of service and warmth of Terrie and Mike is absolutely first class. 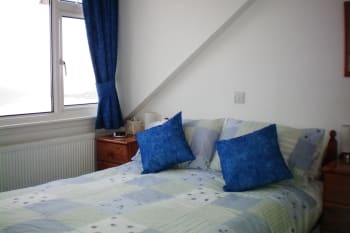 An excellent location for e relatively flat walk into the town or a stroll along the coastal path. Thank you so much for your review. We are so glad you enjoyed your stay with us. 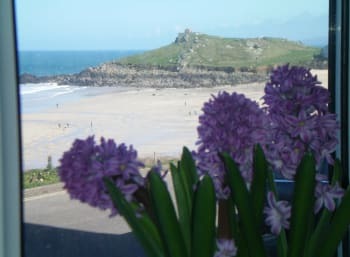 Wonderful hosts and a great location with fabulous views over Porthmeor beach. We have stayed with Terrie & Mike for the last 10 years and their standards never waver from excellent. Rooms are spotless & beautifully presented. There is a wide choice of Breakfasts. Off road car parking is also a big plus. 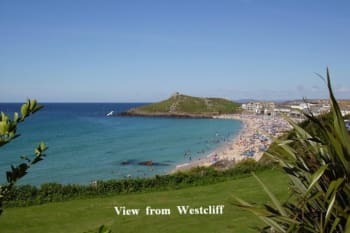 St. Ives is the premier holiday destination in Cornwall & we recommend Westcliff B&B to all of our friends. Thank you Joan and Tony - it is always lovely to see you and thank you for being such wonderful guests, and for even joining us at the beach barbecue. Hope to see you again soon. Thank you for your review - it was lovely to meet you both. We have stayed with Terrie and Mike for many years and have always received a very warm welcome. We have thoroughly enjoyed our holidays at Westcliff. Terrie and Mike like to make sure that their guests are happy and do everything that they can to ensure this. St Ives has everything one would want on holiday. There is a good selection of places where you can eat good food. A fine choice of beautiful sandy beaches are available, not surpassed anywhere. 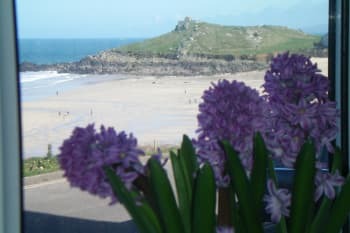 Many things to see and do covering art and craft shops, art galleries,(including The Tate Modern Gallery), boat trips, interesting boutique shops, a fantastic harbour, local walks, cream teas and not forgetting the traditional Cornish pastie! Thank you so much for your lovely comments. We are very glad that you once again enjoyed your holiday and look forward to seeing you again next year. Thank you - we are glad you enjoyed your stay. Only improvement I would like is a tastier sausage at Breakfast. St Ives has very high standard seafood pubs and restaurants However booking ahead in peak season is necessary. Thank you for your review and the 'excellent' rating. However, you have stayed with us many times and must have been too polite to let us know that you would prefer a different sausage. We always try to give satisfaction so remind me before you come next year and I'll get the brand you enjoy. Thanks for your honesty. See you next June. Your happily singing from kitchen made my day! Thank you for your review - it was lovely to meet you and Mike and I are very glad that you enjoyed your stay. Lovely hosts very frinedly and helpful. Geevor Mine. Walk along coastal path to Lelant.Minack Theatre. Captains Table at The Sloop. Rum and Crab shack. Thank you for your review - we always appreciate knowing that our guests have enjoyed their stay. Lovely week with Terrie And Mike. A most pleasant and helpful couple. Tate St Ives. Barbara Hepworth House and Garden. Grave of Alfred Wallis. The Minack Theatre. Penlee Gallery and Museum. Thank you so much for your review - Mike and I are delighted that you enjoyed your visit to beautiful St. Ives. We always enjoy our stay with you, as usual you maintained an excellent standard which has been always the same every year. Your breakfast is always great especially the whole or the sliced mushrooms !!! You and Mike always make us very welcome. Always book your restaurants as soon as possible or you won't get a table at your place of choice. Thank you so much for your review. It's always good to know that our guests are happy. Hope to see you again soon. Thank you for your review. I am glad you enjoyed your stay. Thank you for your review. I am glad you enjoyed staying with us. Very friendly, excellent breakfasts. 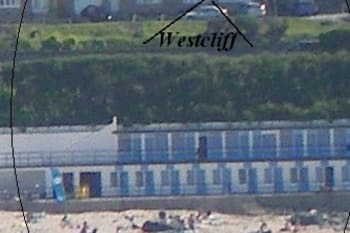 Super position overlooking Porthmaen beach. We enjoyed sitting in the bay window of our room, watching the sea and the surfers. Thank you for your lovely comments. I am so glad you enjoyed your stay.